This is not your regular vegetable soup, this was my grandmother’s vegetable soup. Made exclusively on Chinese New Year’s Eve reunion dinner, among many other things. Chap Chye Th’ng or Nyonya mix vegetable soup is uniquely a Penang dish. The flavor base of this soup is made out of cabbage, jicama bean, carrots, dried cuttlefish, pork bones and fried garlic oil, which gives it an aromatic and rich flavour. 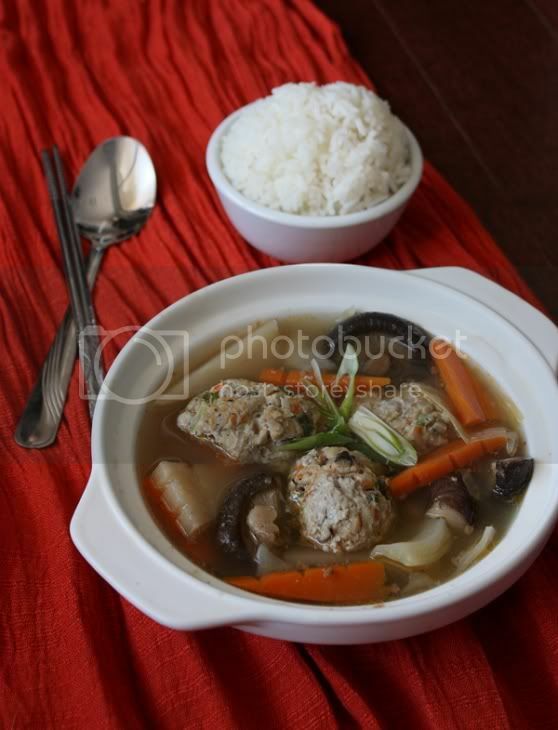 My grandmother makes her homemade bak wan/ meatballs to go with this soup. She steams them separately before serving them in the soup so that the meatballs do not lose its flavor or overcooked in the pot. This soup is especially comforting to drink on a cold day in February. 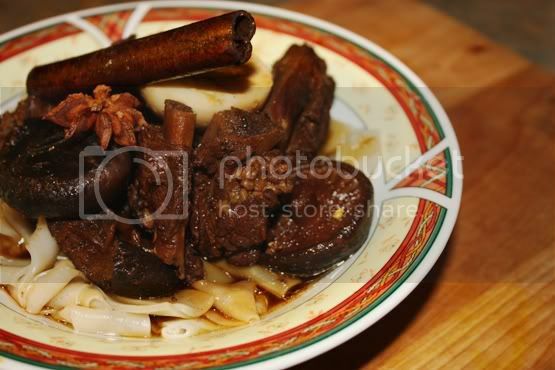 Like most Nyonya cuisine, it is not the most photogenic of foods. It’s extremely hard to take pictures of this soup, and to make it look at least presentable for this blog took me about a day. By the time I was done, the soup was stone cold but luckily I have more in my cast iron pot. Preparation for this soup may take longer than the cooking time. I said “may” because it depends if you want to cut the carrots and jicama bean into nice patterns. The good thing about this vegetable soup with meatballs is that absolutely nothing goes to waste. And you’ll see why. In a large pot (with steamer attach would be extremely convenient), fill it with 8 cups of water and bring it to boil with the pork bones, dried cuttlefish, ginger slices, onions and white peppercorns. Let it cook for 30 minutes. Add the jicama bean and mushrooms in, and cook for 15 minutes before adding the cabbage and carrots in. Cook the soup for another 30 minutes and then stir in two tablespoons of ginger oil, lower heat to a low simmer until ready to serve. Mix all the ingredients together in a bowl with your finger tips. Shape the meatballs into large two inch balls and steam them over the top of the soup pot (that comes with a steamer) for 15 minutes. I’ve decided to share a roast chicken dish with her and her readers because roast chicken is a chockful of prosperity goodness to eat on Chinese New Year. This is unlike the traditional Chinese roast chicken fare, I’ve supped it up with some Szechuan peppers and vanilla. You’re going to call me crazy but that vanilla powder I’ve included in my recipe gives a special savoriness to the roast chicken. It’s like all the spices melded together in perfect harmony. 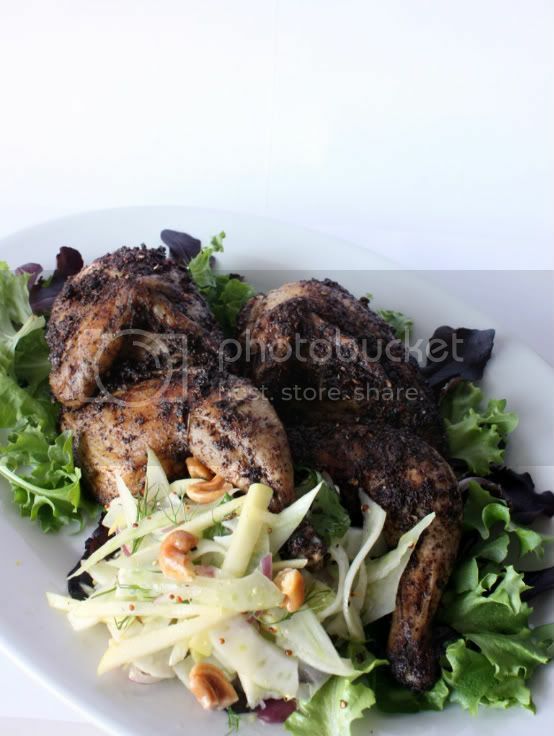 On the side, I served my chicken dish with a fennel and apple pickle and cashew nuts. Happy Chinese New Year guys! For full recipe, visit Rasa Malaysia for the full post of my Szechuan/Sichuan Roasted Chicken Recipe! 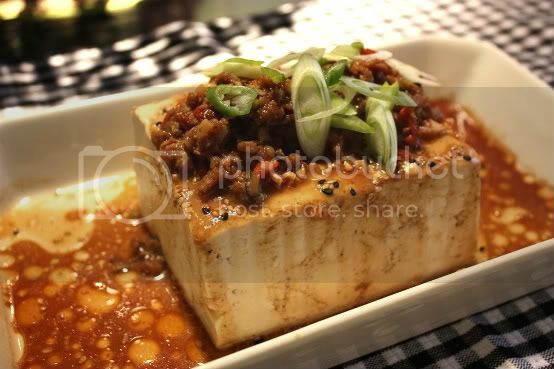 This is a very Chinese-style dish that often made it to my family’s dinner table back home in Malaysia; steamed silken tofu with meat sauce garnished with ginger-garlic oil and scallions. I made this on a work night to go with some rice and simple stir-fried veggies and that’s dinner in less than 45minutes. You can use vegetarian “meat” as a substitute for this dish as I had done. I bet you couldn’t even tell the difference from that picture! 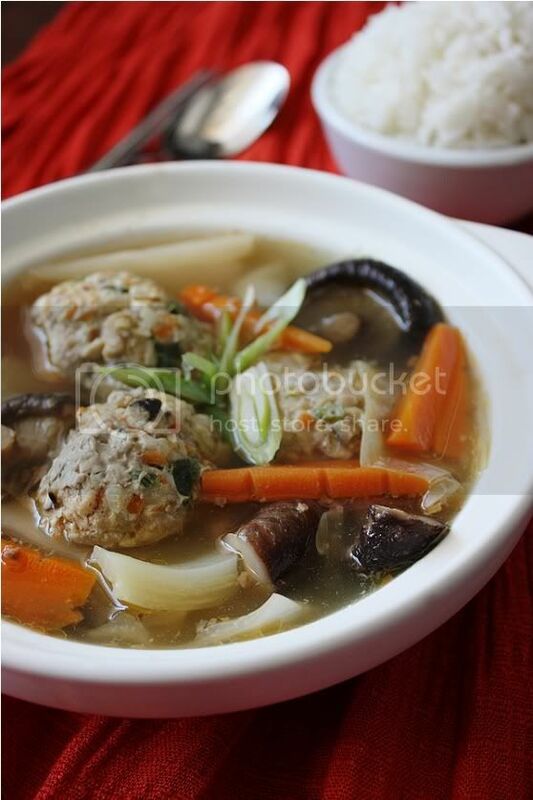 Feel free to use minced chicken, pork or shrimps in this recipe, it would still be very tasty. 1. Carefully remove tofu out of its package and pat it dry with a paper towel. Wrap paper towels around the tofu and set it over a plate, cover with another plate and put some weight over the top. This is to draw the extra water out of the tofu. I used canned vegetables as my weights. Do this for 10 minutes and prep the other ingredients. 2. To make the meat sauce, pre-heat a pan over medium high heat until hot. 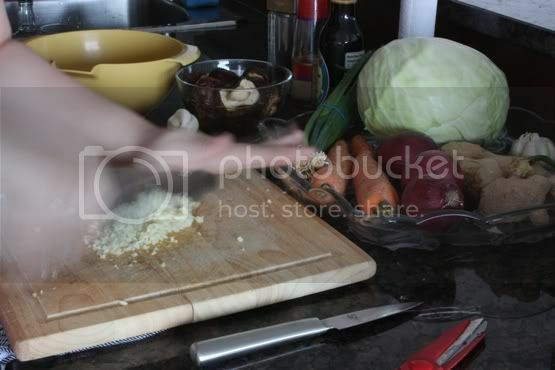 Add oil and sesame oil and add in garlic for a saute, do not burn the garlic. 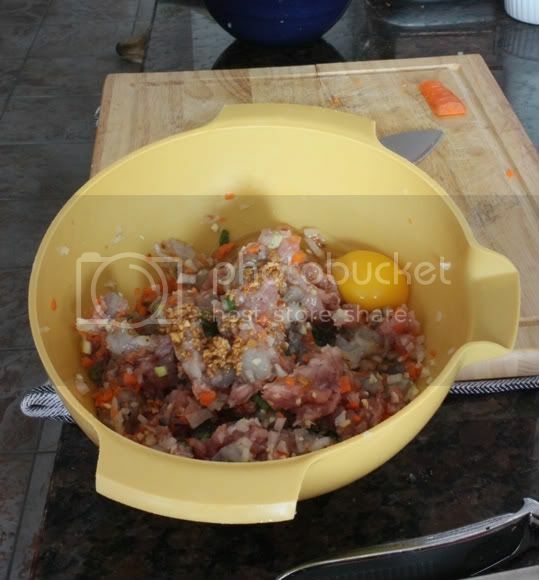 Add your minced meat in and cook the meat for 5 minutes, until it is nicely infused and fragrant with the oil. 3. Add the rest of the ingredients in and let the meat sauce come to a simmer. Once it is slightly reduce, the meat sauce is ready. Set aside. 4. Remove the paper towels off the tofu, and place the silken tofu in a plate. Add the meat sauce over the top of the tofu and steam it in a steamer for 10 minutes. 5. To serve, garnish with chopped green scallions and ginger-garlic oil drizzled over the top. There are two ways you can do this, by frying the ginger and garlic in oil in a pan on your stove top until golden brown or via your microwave. I did it in the microwave because it’s simple and does not compromise the flavor of the oil. 1. Mix the ginger and garlic with oil in a microwavable bowl and put it in the microwave for 2 minutes. If the garlic and ginger still looks a bit pale after two minutes, cook for another 30 secs until it is golden brown. I don’t cook enough Malaysian dishes in my kitchen. 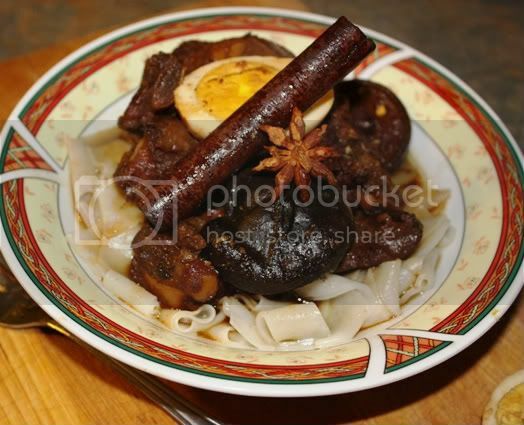 This is my mother’s/grandma’s Tau Yew Bak recipe that I grew up eating as a kid. This braised pork dish is comfort food to me as a big bowl of osso bucco are to the Milanese. 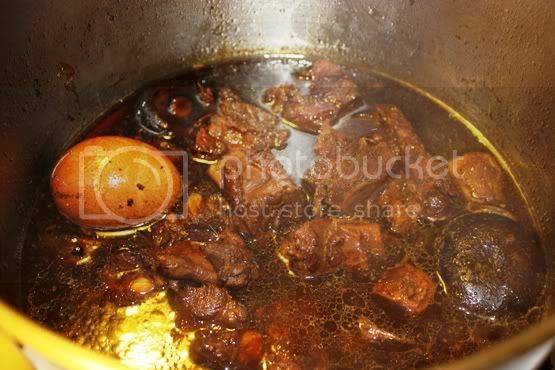 The meat is braised for an hour or two in an aromatic dark sauce flavored with star anise, cinnamon, black peppercorns and a whole head of garlic. It’s a very Penang Hokkien dish. And in Penang, this dish is eaten with white rice and a dollop of sambal belachan. There are many variations of this dish because it’s really a provincial dish that went on a national scale. So every Chinese grandmother has their own way of making this dish but the basics are pretty much all the same – star anise, cinnamon, garlic and pork. Traditionally, pork belly is used in this recipe. The lard is what makes Tau Yew Bak good but other cuts of pork are permissible as well. My mom likes to use several different cuts for more variety. I used a meaty cut of pork ribs, and I asked the butcher to cut them into 1.5inch chunks for shorter braising time. You can put in big chunks of ribs in and cook it country-style, too. Optional but commonly used ingredients: Potatoes (big chunks), bean curd sticks, fried tofu pieces, Chinese mushrooms, canned button mushrooms, eggs. You may also use chicken in place of pork as well. It’s equally delicious in a chickeny sort of way. 1. Pre-boiled the pork ribs in boiling water for 5 minutes to get rid of any impurities. 2. Drain water from the pot and heat it up with oil. Add the pork, garlic, star anise, black peppercorns and cinnamon in. Saute until aromatic. 3. Now, add the soy sauce, dark soy sauce, and sugar in. Saute until the pork is completely covered by the dark sauces and the sugar began to caramelized a little. Be careful not to burn the sugar. As soon as you see that the bottom of the pan begins to stick, add the 3 cups of water right away. 4. Add water as soon as caramelizing of the sugar begins. Scrap the bottom of the pan a bit with your spoon and let pot come to a boil. If you are adding any of the optional ingredients listed above, you may add them right now. 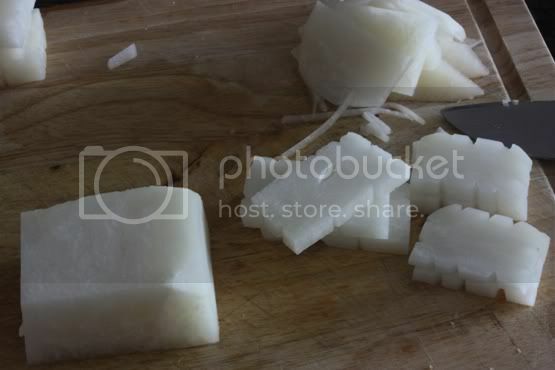 Make sure your potatoes are in big pieces so they are able to withstand long the long cooking time. I usually put them whole, if I’m using them. If you’re using eggs put them in just before serving if you don’t want to overcook them. Usually, overcooked eggs with gray rings around the yolk is not uncommon in this recipe. The star of the show is the fall-off-the-bone delicious meat and it’s flavorful sauce. 5. Once it starts to boil, lower the heat to a simmer and cook covered for 1.5 hour. Serve hot on steamed white rice and a dollop of sambal belachan. I served mine on some thick rice noodles because I had some on hand. Now, I cannot explain how wonderfully aromatic the meat is once cooked. It’s simply the most nourishing smell for the soul. Don’t waste any of the sauces, bread makes for a good vessel for soaking up the goodness! 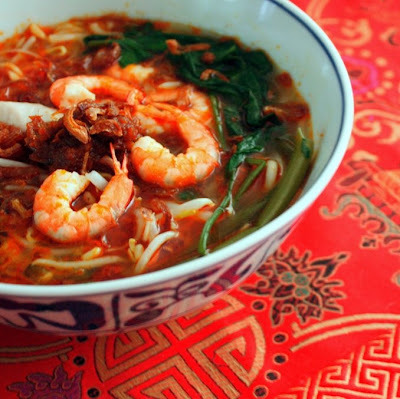 One of my favorite comfort food is Prawn Mee (or Hokkien Mee to Penangites) in Malaysia. While my mother’s Pan Mee still top my list but a piping hot bowl of Hokkien Mee comes to a close second. It makes it even better when the Hokkien Mee is prepared by my mom on a rainy day. I need to ask mom for her recipe. Staring at that picture is just making me hungry all over again!